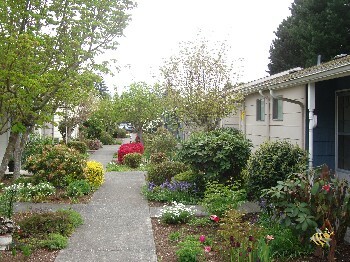 Housing for Seniors 62 years of age or older or disabled of any age. This property is partially subsidized offering 26 out of 40 units with direct subsidy through the USDA Rental Assistance Program. The low-income rent structure calculates your rent to 30% of your monthly income- depending upon your income level. Situated in a park-like wooded setting with individual patio and garden areas. Non-smoking property. Picnic areas under the trees and large grassy courtyards. Many units have new carpet, vinyl and tile. Convenient to downtown Marysville with lots of options for shopping, restaurants, churches and events. Great freeway access. Large community room with social activities, potluck, bingo, card parties and nice manager. Dart Bus available for on-call service. ALL UTILITIES ARE INCLUDED. CALL NOW! Large community room with activities for residents. Ground floor cottage style apartments. This property is partially subsidized offering 26 out of 40 units with direct subsidy through the USDA Rental Assistance Program. With subsidy your rent will be calculated to 30% of your income and the government will pay the difference each month. Subsidy is usually not available at move-in. Once a tenant, you may qualify for our waiting list for subsidy based on the percentage of income you will pay toward rent. Two bedrooms must be rented by two people unless for a reasonable accommodation. Utilities included in rent.